In just 10 days Bitcoin will be forking based on the SegWit2X code scheduled for block height 494784 which is estimated to happen on November 16, 2017 (at the time of this writing). The time may vary slightly based on block interval times not being precisely 10 mins each time they are found. During the month of November 2017, approximately 90 days after the activation of Segregated Witnesses in the Bitcoin blockchain, a block between 1MB and 2MB in size will be generated by Bitcoin miners in a move to increase network capacity. At this point it is expected that more than 90% of the computational capacity that secures the Bitcoin network will carry on mining on top of this large block. The premise behind the fork (upgrade) goes back to 2016 when an agreement was made in Hong Kong between developers and miners to upgrade to 2MB blocks along with activating Segregated Witness. Then in May 2017 in New York the agreement was revisited and put into play with an action plan to upgrade at a set block height. The 2X part of the SegWit fork has unfortunately been met with push back from some within the Bitcoin community, but the fork is still scheduled to happen which may result in two blockchains depending on how the market reacts to the fork. Some have even suggested using Bitcoin Cash as a way to hedge against any volatility the fork may bring. At this time, the Bitcoin market is extremely bullish heading into the fork with prices up from $4,500 just 30 days ago to $7,400. 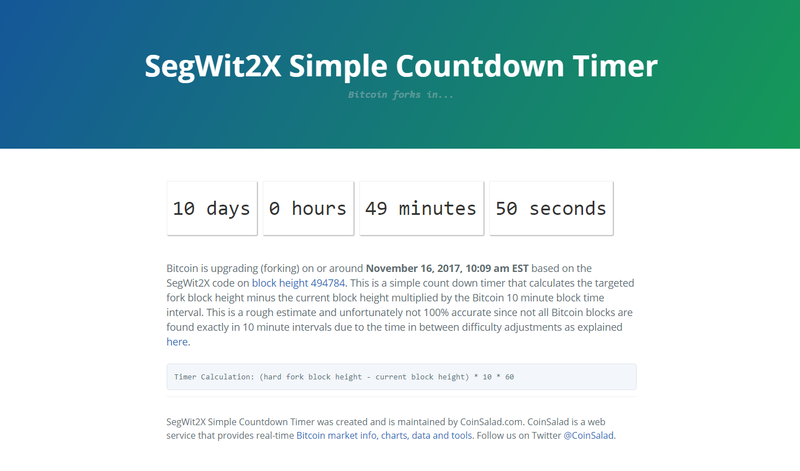 You can keep track of the fork using the SegWit2X Simple Countdown Timer clock. Want to see more Bitcoin tools and charts? Head on over to CoinSalad.com. If you are just getting started in Bitcoin, read the Bitcoin FAQ to get started.